Numerous studies from cognitive and educational psychology research have highlighted the strong association between spatial reasoning and mathematics performance. This chapter examines this relationship from a mathematics education perspective, with a focus on elementary classrooms. Three spatial constructs critical to mathematics instruction and learning are identified: namely, spatial visualization; mental rotation; and spatial orientation. These constructs are described in relation to student’s encoding and decoding of mathematics information and the increasing influence these constructs have on mathematics assessment. The extent to which spatial training can enhance student’s math performance is also considered in relation to these three constructs. 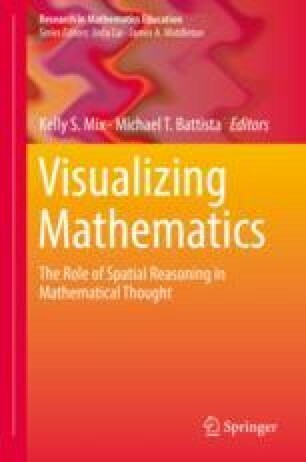 Implications highlight the potential of explicitly focusing on spatial reasoning in math classrooms, given the malleability of instruction and ongoing affordances of technology. Australian Curriculum, Assessment and Reporting Authority [ACARA]. (2011). Australian Curriculum v7.5: General capabilities: Overview. Australian Curriculum, Assessment and Reporting Authority, Commonwealth Government. Retrieved on February 29, 2017, from: http://v7-5.australiancurriculum.edu.au/generalcapabilities/numeracy/organising-elements/using-spatial-reasoning. Curriculum Planning and Development Division. (2006). Mathematics syllabus primary. Retrieved from the Singapore Ministry of Education: http://www.moe.edu.sg/education/syllabuses/sciences/files/maths-primary-2007.pdf. Ministry of Education, Curriculum Planning and Development Division. (2006). Mathematics syllabus primary. Retrieved from the Singapore Ministry of Education website: http://www.moe.edu.sg/education/syllabuses/sciences/files/maths-primary-2007.pdf. ServiceOntario Publications. (2014). Paying attention to spatial reasoning, K-12: Support document for paying attention to mathematics education. Retrieved from http://www.edu.gov.on.ca/eng/literacynumeracy/LNSPayingAttention.pdf.